7.1: What is a Scale Drawing? Here are some drawings of a school bus, a quarter, and the subway lines around Boston, Massachusetts. The first three drawings are scale drawings of these objects. The next three drawings are not scale drawings of these objects. Discuss with your partner what a scale drawing is. Your teacher will give you a scale drawing of a basketball court. The drawing does not have any measurements labeled, but it says that 1 centimeter represents 2 meters. Measure the distances on the scale drawing that are labeled a–d to the nearest tenth of a centimeter. Record your results in the first row of the table. The statement “1 cm represents 2 m” is the scale of the drawing. It can also be expressed as “1 cm to 2 m,” or “1 cm for every 2 m.” What do you think the scale tells us? How long would each measurement from the first question be on an actual basketball court? Explain or show your reasoning. On an actual basketball court, the bench area is typically 9 meters long. Without measuring, determine how long the bench area should be on the scale drawing. Check your answer by measuring the bench area on the scale drawing. Did your prediction match your measurement? 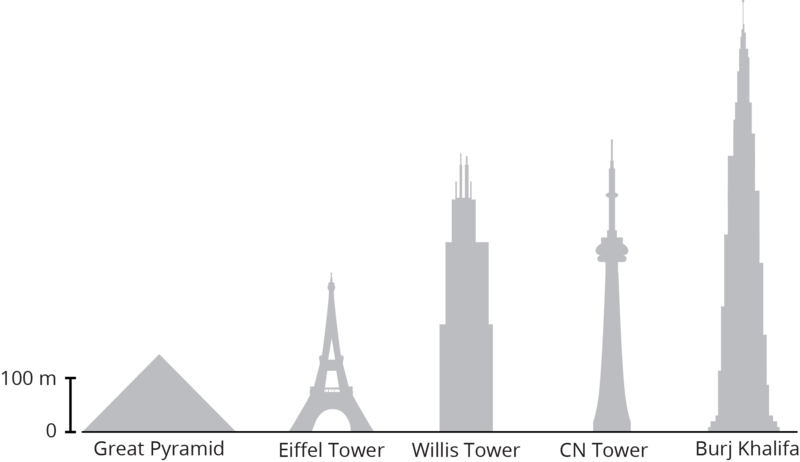 Here is a scale drawing of some of the world’s tallest structures. About how tall is the actual Willis Tower? About how tall is the actual Great Pyramid? Be prepared to explain your reasoning. About how much taller is the Burj Khalifa than the Eiffel Tower? Explain or show your reasoning. Measure the line segment that shows the scale to the nearest tenth of a centimeter. Express the scale of the drawing using numbers and words. The tallest mountain in the United States, Mount Denali in Alaska, is about 6,190 m tall. If this mountain were shown on the scale drawing, how would its height compare to the heights of the structures? Explain or show your reasoning. Every part corresponds to something in the actual object. Lengths on the drawing are enlarged or reduced by the same scale factor. Sometimes the scale is shown as a segment on the drawing itself. For example, here is a scale drawing of a stop sign with a line segment that represents 25 cm of actual length. The width of the octagon in the drawing is about three times the length of this segment, so the actual width of the sign is about $3 \boldcdot 25$, or 75 cm. Because a scale drawing is two-dimensional, some aspects of the three-dimensional object are not represented. For example, this scale drawing does not show the thickness of the stop sign. A scale drawing may not show every detail of the actual object; however, the features that are shown correspond to the actual object and follow the specified scale. A scale drawing of an object is a drawing in which all lengths in the drawing correspond to lengths in the object by the same scale. The scale tells you how the lengths correspond; for example, a scale of "1 inch to 2 feet" means that 1 inch in the drawing represents 2 feet in the object.